Big Bear, CA – Sunday, November 4 is the end of Daylight Saving Time. It’s time to “fall back” one hour. 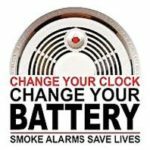 When you change your clocks, it is also time to change the batteries in your smoke alarms and carbon monoxide detectors. While phones, computers, and tablets may change themselves, it’s up to you to keep yourself and your family safe by changing your smoke alarm batteries. 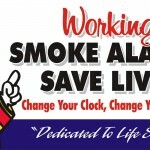 Working smoke alarms save lives. Three out of five home fire deaths result from fires in properties without working smoke alarms. But, the risk of dying in a home fire is cut in half in homes with working smoke alarms. An alarm should be installed on every floor of your home, in every bedroom, and outside of all sleeping areas. The more alarms you have, the greater your chances are of surviving a fire. However, just installing a smoke alarm is NOT enough. It needs to be tested monthly and the batteries changed every year. You should also replace your smoke alarms every 10 years. April 24 is Safe Kids Day, Are Your Kids Safe Kids?